Experience the speed and convenience of PlatePass®. PlatePass® allows you to use cashless lanes or all-electronic tollways without using a personal transponder or paying the toll authority directly. You’ll be able to use PlatePass® throughout the U.S. and Puerto Rico. For a complete listing of participating toll roads and state maps, please visit PlatePass.com/locations. PlatePass® is an electronic toll payment solution that enables you to use covered cashless toll collection lanes or all-electronic tollways, without the use of a personal transponder or paying the toll authority directly. What are the benefits PlatePass®? 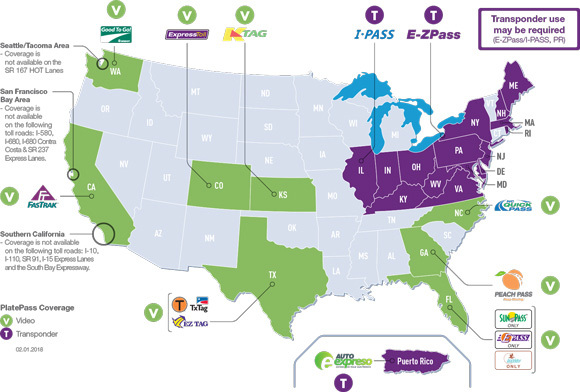 For Transponder regions: In E-ZPass and I-PASS regions, your rental vehicle may be equipped with a transponder. The transponder communicates with the tollway using radio frequency technology, collecting information from the transponder to pay the toll. If the transponder malfunctions, or is not present, your rental vehicle will still be enrolled in PlatePass® if you incur tolls without using a personal transponder or other approved payment method. For Video regions: The toll authority’s technology obtains a photo of the vehicle’s license plate, which allows the toll authority to assess tolls to that vehicle. For Transponder regions: To use PlatePass®, slide open the gray transponder box behind the rearview mirror (if available), so that the toll agency can read the transponder. If your vehicle is not equipped with a transponder, simply drive through the toll lane. The toll road system will automatically read the license plate of the vehicle. Hertz rental vehicles are PlatePass® enabled for use on covered tollways. PlatePass® will only activate if you drive on covered tollways without using a personal transponder or another form of payment for tolls approved by the applicable toll authority. For Video regions: To use PlatePass®, simply drive through the toll lane. The toll road system will automatically read the license plate of the vehicle. Hertz rental vehicles are PlatePass® enabled for use on covered tollways. PlatePass® will only activate if you drive on covered tollways without using a personal transponder or another form of payment for tolls approved by the applicable toll authority. What if I do not want to purchase PlatePass®? To avoid using PlatePass®: (1) If your rental vehicle includes a transponder, make sure it remains secured within the shield box, with the shield box closed and (2) pay all tolls with cash, with your personal toll transponder (where permitted) compatible with the toll road, or directly to the toll authority (where permitted). Some tollways without cash lanes permit payment in other ways and at other times. Toll authorities sometimes change their toll payment options. Check with the applicable toll authority to learn all payment options. How much does PlatePass® cost? You will be charged for each toll at the highest, undiscounted toll rate plus a $4.95 convenience fee for each calendar day when tolls are incurred. There is no maximum PlatePass® convenience fee. PlatePass® charges applied to your credit card statement will read: Hertz Toll Charge - ATS. Charges usually appear on the credit card statement within 1-3 weeks after the rental agreement has closed. Charges will not appear on your rental invoice. Hertz has assigned the billing rights to ATS Processing Services LLC/PlatePass® LLC as Hertz’ agent. How can I obtain a receipt for the charges? You may obtain a summary of PlatePass® charges at platepass.com/receipt by entering your rental agreement number and rental date. Tollways that are integrated with the PlatePass® network, including, but not limited to, highways, bridges, and tunnels. All-electronic tollways operate using 100% electronic toll collection (also known as Open Road Tolling). Drivers using all-electronic tollways do not have the option to pay tolls with cash at the time of using the tollway. Drivers using an all-electronic tollway may see signs indicating vehicles without a compatible transponder will be billed for tolls by mail by the local toll authority. However, toll authorities are unable to bill Hertz rental customers directly, and if a rental customer drives on a covered all-electronic tollway without using a personal transponder compatible with the tollway, or paying with another form of payment approved by the toll authority, PlatePass® will activate and charges will apply. Which tollways are all-electronic with no option to pay for tolls with cash? The following tollways and bridges are covered by PlatePass® and do not offer you the option to pay with cash. Some toll roads and bridges without cash lanes permit payment in other ways and at other times*. Toll authorities sometimes change their toll payment options. You should check with the applicable toll authority to learn all payment options. What happens if I use tollways not covered by PlatePass®? You must pay cash or use a transponder compatible with the tollway. If you do not pay for tolls with cash or transponder, you will be issued a toll violation. PlatePass® is not available on tollways in Alabama, Alaska, Louisiana, Michigan, Minnesota, Nevada, Oklahoma, Oregon, South Carolina, Utah, or California roads: I-10, I-110, SR 91, I-15 Express Lanes, SR 125. What if I am renting in California? What if I am renting in Southern California?